The standard Joomla install looks pretty bland, and think how boring the web would be if all these Joomla sites all looked the same. That is where templates come in. Templates allow you to completely changethe layout and look of your Joomla site, and with a little bit of work you end up with an individual site just for you. There are many places where you can get Joomla templates, but I've reviewed the best of them for you right here. Read My Independent Review and Discover the Truth of Joomla Bamboo! There are several different methodologies when it comes to designing Joomla templates. You can either go for feature upon feature, or go for classy design and clean looks. Joomla Bamboo fall into the later category, and they do it damn well. What version of Joomla do the templates work on - Joomla 1.x or 1.5 ? As of August 2008, all of Joomla Bamboo's new templates will be Joomla 1.5, however many of there older templates are still only Joomla 1.0. It does show, with the newer templates having a much more streamlined appearance that is more in line with current web trends. They do offer an additional service to port 1.5 templates back to 1.0 if required (at additional cost). How many template are there and how often do they get updated? There is currently 31 templates available, and an additional template is added every month. How good are the templates and how much can I customise them? Highly stylistic design does have it's draw backs, and felxibility is one of them. 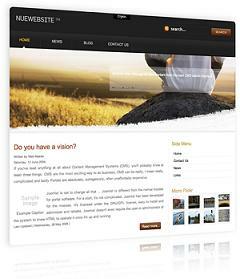 With?Joomla Bamboo's templates you really to get what you see. Basic elements are customisable, such as logo's and background images (if you know what you are doing), but little else. If you like the design then it will be money well spent, with the designs all very stylish and useful. What other features and bonuses are offered? Joomla Bamboo do offer a range of free components for download, however these are free for everyone, and are not part of the subscription package. Unfortunately, I was unable to test these extensions as they would not function correctly in my Firefox3 beta. No such problems were encountered with the templates. Joomla Bamboo is definitely a template club to watch. While most templates are extremely limiting in their purpose, they are getting more flexible with each release. It looks like they are starting to realise that a good template can have more than one purpose (which is a strenth of the RocketTheme templates). With steadily improving templates and very competitive pricing they are bound to be a force in the future.